Tre Scalini is a deluxe 3 bedroom, 3 bath waterfront vacation villa located on Bovacoap Point in an exclusive and peaceful residential area of Chocolate Hole on St. John's south shore.. This wonderful and conveniently located villa overlooks Devers Bay and Chocolate Hole Bay and affords dramatic southerly and westerly views of St. Thomas Island, several surrounding cays and the mesmerizing Caribbean Sea beyond. Tre Scalini was constructed and designed with a naturalist eye to take maximum advantage of St. John`s natural beauty and native elements. With 20` vaulted ceilings, a full length deck and 1.5 acres of landscaped and natural grounds, including a private pathway to the waterfront, visitors will find unmatched privacy and peaceful surroundings together with the never ending sounds of the surf crashing onto the shorelines. In the mid-2000's the villa was extensively renovated including a new gourmet kitchen and appliances, elegantly tiled en suite bathrooms with garden styled walk-in showers in the upper bedrooms, new decking and railings and upgrades to the landscaping. 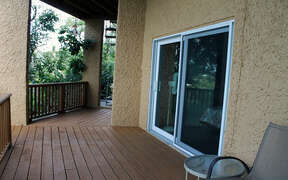 More recently, windows were replaced in the upper bedrooms and air conditioning has been added to all bedrooms. From the private driveway and parking area you will enter the villa through a gated courtyard (featuring an array of native plants) which leads directly into the great room on the main level of the villa. There is only one step down from the parking area to the main entrance and only a single step down to either upper level bedrooms so this lovely villa is friendly for some handicapped individuals. 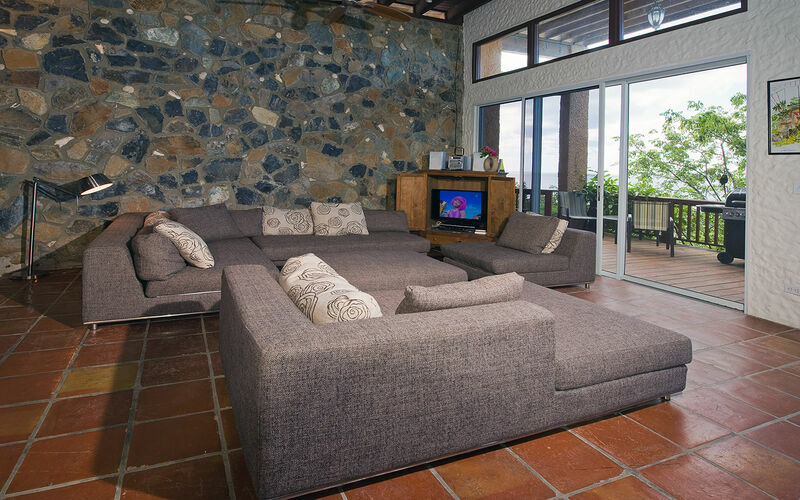 The comfortable living room offers plenty of couches and chairs for lounging and relaxing. 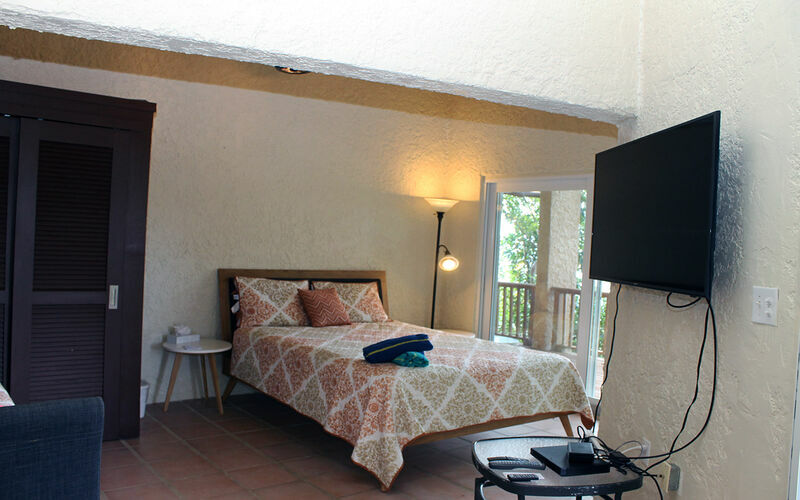 An entertainment center features Cable TV, DVD Player, Stereo system with MP3 connection and free wireless internet service is available throughout the villa. The adjacent indoor dining area with seating for six is also conveniently located next to the kitchen which features a arched opening for conversing with the cook and passing dishes back and forth. The absolute highlight of the Great Room is the floor to ceiling glass windows and doors which frame the magnificent ocean views. Directly outside the Great Room is the full length, covered balcony which features several comfortable seating and lounging areas, a gas BBQ grill and a dining table and chairs for alfresco dining. There are two bedrooms located on the upper level on either side of the great room. The master bedroom features a king size bed with en suite tiled bathroom and walk-in garden shower. 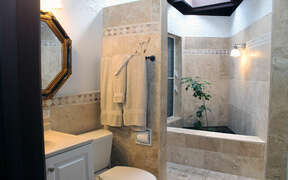 The upper level guest bedroom features a queen size bed with en suite tiled bathroom and walk-in garden shower. Both of the upper level bedrooms feature individually controlled split air conditioning systems. The lower bedroom is accessed via a spiral staircase from the upper deck or by an outside staircase to the lower level and offers twin beds (which can be converted to a king bed) and en suite bathroom. This bedroom is also equipped with individually controlled air conditioning. Tre Scalini is located in a very private area on a dead-end road which provides unmatched quiet and solitude. With virtually no ambient noise pollution you will relish in the sounds of the surf echoing through the villa 24/7, the cacophony of tree frogs following a refreshing rain or the peaceful conversations with friends, loved ones and family as you enjoy an unforgettable vacation at Tre Scalini . Additionally, with an unobstructed view to the south and west, you will experience dramatic sunsets nearly every day from the deck at Tre Scalini. 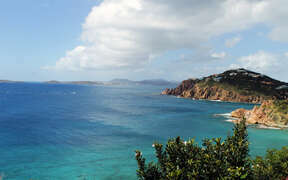 Be sure to be home with your favorite `sundowner` cocktail to enjoy the most spectacular sunsets to be seen on St. John! Tre Scalini Villa is professionally managed and maintained by a duly licensed and insured on-island Property Management Agency. Our staff are ‘locals’ who live on St. John year around who intimately know the island of St. John and specialize in providing unparalleled hospitality services for our guests. We are the experts on St. John and are best equipped to provide knowledgeable, up-to-date advice about all relevant activities, features and amenities which are available to enhance our guests vacation experience. Please note that the rates posted on this site are for 1-6 guests and do not include applicable taxes and fees.